Nezu museum is a small museum close to Omotesando, where the private collection of Nezu Kaichirō (1860-1940) is on display. Nezu Kaichirō was a Japanese businessman (famous for his work at Tōbu Railway) and an avid collector of pre-modern Japanese and East Asian art. The museum was established in 1941 after his death. His collection survived World War II as they shipped it to the countryside to keep it safe. The main reason to visit this place is the exquisite cafe that immerses you in a green environment, quite unlike its surroundings in the trendy Omotesando neighbourhood. 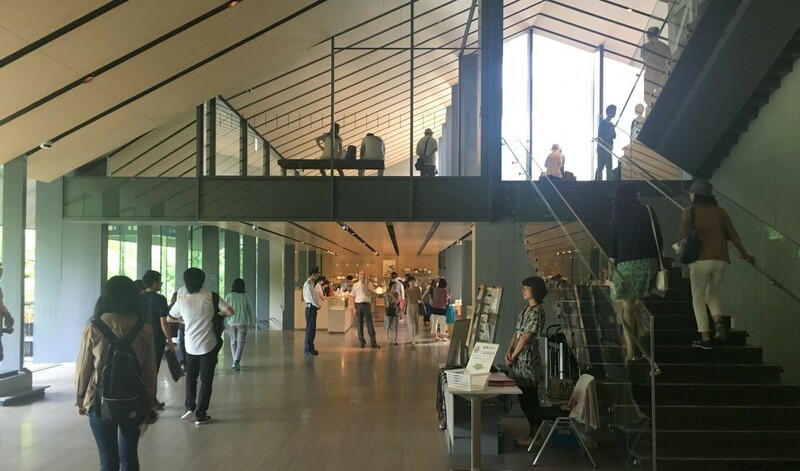 The entrance fee of the cafe is rather steep, as you will need to pay the entrance fee for the museum as well (JPY 1100 for adults). But without this additional fee this cafe would be too crowded I guess. 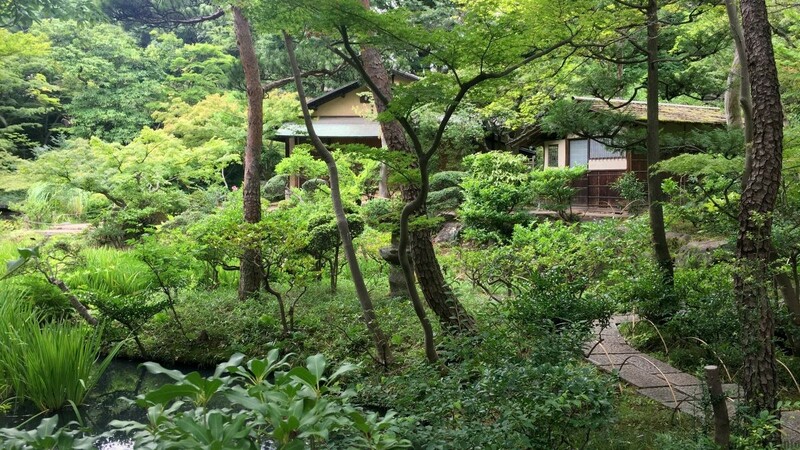 Two of the teahouses in the garden. The walls of the cafe are made up of glass and the inside is kept a little bit on the dark side, so the effect of the green surroundings is amplified. 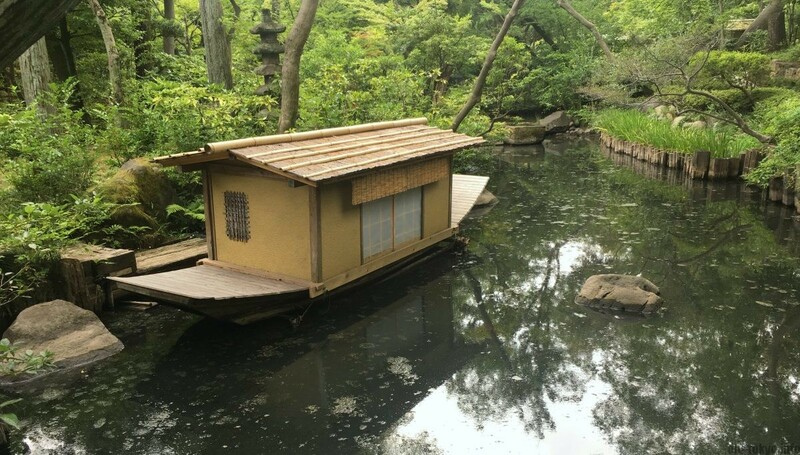 One part of the roof seems to be made from Japanese paper (washi) that adds to the atmosphere. The veins of the washi first reminded me of the shadows of tree leaves. After your coffee you can take a walk in the carefully maintained garden, which kind of felt like a wilderness in summer due to its thick foliage. Statues are placed all over the garden as an extension of the museum exhibit. It is interesting that it was not possible to see the surrounding buildings from the garden, you really seem to be out of the city. The pond at Nezu museum garden. The garden has a pond, four teahouses (you cannot enter) and a stone path that takes you up and down through the garden. It is larger than I initially thought so you will need at least 30 minutes to get around, and preferably longer. The original garden started out at the start of the 20th century after Nezu Kaichirō purchased the land in 1906 and was designed in the shinzan-yūkoku style (which means deep mountains and mysterious valleys). There are 8 specific views in the garden (see the map in the leaflet you receive at the entrance of the museum), but they are not really all that special. As a bonus, there is the museum with many artefacts from China, Korea and Japan. As I heard the museum was rather small, I had quite low expectations, but I was positively impressed with the collection of bronze pots, Japanese scrolls and ceramics (there was a special ceramics exhibition when I visited). Please note only a limited part of the collection is on display at any given time. It is also very foreigner-friendly as all of the items have English explanations. While at other museums there is always some sort of unbalanced provision of information, in this museum everything was nicely explained in English as well. I really appreciated the explanation for the picture scrolls, where an English translation was provided for every section of the story so you could follow the story very well. The museum building was completed in 2009, by the renowned Japanese architect Kengo Kuma. Nezu museum is not related in any way to the old Tokyo neighbourhood called Nezu.